One of the surest ways to lose a sale? The consumer is ready to make a purchase, having physically come all the way to your store, but the product is no longer in stock. They leave, frustrated and empty-handed. Example: Avoiding this catastrophe, Home Depot’s and Lowes’s online orders are picked up in-store 45% and 60% of the time respectively. The companies have made in-store inventory details available to online consumers who likely want to save time by avoiding massive aisles, crowds, distracting products, and long checkout lines. Keep your inventory updated and visible to online shoppers, saving them the hassle of calling or driving all the way to the store, only to discover it’s not in stock. Offer a variety of shipping timetables and delivery options. Not everyone wants their purchases sent to their homes. Ensure products can be picked up, delivered to PO Boxes, and any other method consumers request. Make the in-store location of products available to consumers on the mobile app or website. Helping them track down the product on their own without hunting down store staff will result in a quicker and better omnichannel experience. Consumers want the experience they want. 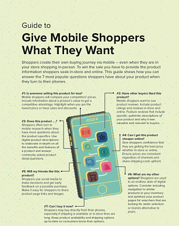 While leaving purchase destinies in the hands of consumers might make some brands and retailers uncomfortable, rolling with this wish and looking for ways to make the process smoother and more engaging are the only answers. Example: Some brands and retailers want to stop consumers from price checking the stores’ competitors while in-store. Amazon is seeking a patent for this technology, but likely not with the same motivation. We don't know yet but Amazon may leave since today the etailer dominates the product search traffic done in-store aisles today. Instead of trying to block the consumer in their journey and risk losing them, simply offer the best price. When faced with a competitor’s price your company can’t beat, redirect the tempted consumer back to your website with a coupon using beacon technology. After all, they are in your store already, play off the convenience and do your best to entice them to purchase before leaving your physical presence. Incentivize with bounce-back promotions. Again using beacon technology, as the consumer is within a few yards of leaving your store’s exit without a purchase, send them a bounce back coupon. They buy today, then the next time they visit, they get an individualized promotion. 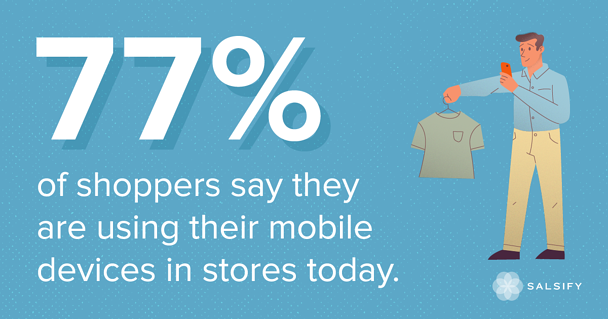 We know consumers use their mobile phones to check product reviews while in-store. Why not make this process easier and build consumer trust while you’re at it? Example: Eighty-seven (!) of U.S. adults prefer at least three product reviews when shopping. As Forrester found, “46% of online adults trust consumer-written online reviews.” And finally, shoppers who reference both reviews and customer questions are 105% more likely to click ‘buy’ during that visit. Using the beacon technology, beam reviews to the consumer as soon as they begin searching for the product name. Include consumer reviews on store signage. For retailers, make reviews of products (even if from competitors’ websites) available in-store for consumers to browse via or in-store tablets. Learn the rest of the common shopper questions.